We all know the compelling reasons that the United States needs to reduce its dependence on fossil fuels. Historically, the greatest increases in energy demand have been for transportation fuels, and known fossil fuel reserves are declining. Byproducts of fossil fuel combustion are steadily increasing the concentration of carbon dioxide and other greenhouse gases in the atmosphere. Computer models predict that changes in atmospheric composition will increase global temperatures and continue to cause profound changes in weather patterns. Along with these concerns, exciting new opportunities are emerging for meeting global energy needs and simultaneously creating high-value bio-based products. The agricultural sector has already made significant progress in developing bio-based fuels and chemicals, and ethanol is a fast-growing business throughout the Midwest. The dominant feedstock for ethanol transportation fuel presently is fermentable sugars derived from agricultural crops such as corn, rice, and sugarcane. An alternative to producing ethanol from food crops is to use the stalks and other non-food portions of agricultural crops as well as trees, grasses, and other herbaceous plants. Trees are one of the best potential sources of biological fuel and chemicals'they grow in marginal soils that will not support agriculture; do not require fertilizer, herbicides, or pesticides; and accumulate biomass density for several years before incurring harvest costs. Although a more challenging process than creating biofuel from agricultural matter, converting wood resources into liquid fuels and chemical feedstock is becoming more cost competitive, thanks in part to researchers at the FPL, who are continually developing technologies to reduce the net cost of renewable bio-fuel. For decades, researching opportunities to improve the economics of producing transportation fuel and chemicals from biomass has been part of the FPL program of work. Biorefinery technology uses chemical, biochemical, and thermal methods for producing chemicals and liquid fuels from biomass. Wood is hydrolyzed into sugars, with those sugars subsequently fermented to ethanol or other fermentation products. Thermochemical conversion methods involve heating biomass under controlled conditions. 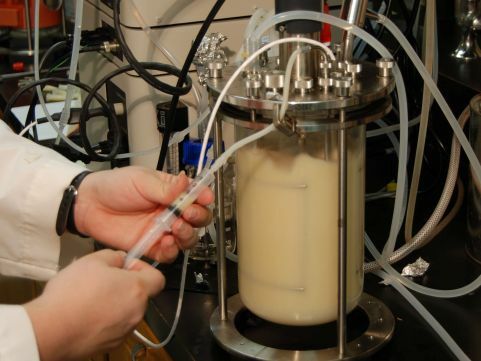 Fermentation research recently progressed exponentially when an FPL scientist successfully modified yeast DNA to increase the amount of ethanol produced when the yeast metabolizes certain components of wood. At the same time that our need for alternative fuels becomes more pressing, large areas of forest lands are littered with an unnatural accumulation of stunted, overcrowded trees and woody debris. Decades of fire suppression have disrupted the natural fire cycle of U.S. forests. Fires on these overstocked stands are more intense and harder to control than forest fires in previous decades, and they often result in catastrophic crown fires that kill large areas of forestlands. An estimated 8.4 billion dry tons of material needs to be removed from the national forests to reduce the risk of fire hazard, insect infestation, and disease. This vast source of biomass is available for production of wood products, chemicals, and energy; yet harvesting this material is expensive. Therefore, to reduce the costs of forest management, we need to find profitable uses for the removed biomass.